I want to begin by presenting the basic position of the Orthodox Church on the Creation of the World and Man, as formulated by the preeminent theologian of our time Fr. John Romanides, whose positions are closest to mine. 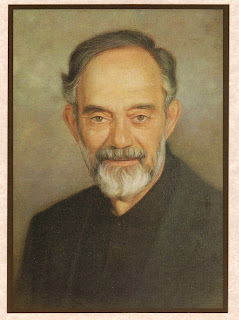 Below are excerpts from his classroom lectures compiled in the much more detailed book by Metropolitan Hierotheos of Nafpaktos titled Empirical Dogmatics of the Orthodox Catholic Church According to the Spoken Teaching of Father John Romanides, which I highly recommend. The excerpts below are from volume two and are actual words of Fr. John Romanides unless otherwise indicated. This will be a six part series that will conclude with my comments. Included will be never before translated material from audio lectures I have on this subject. 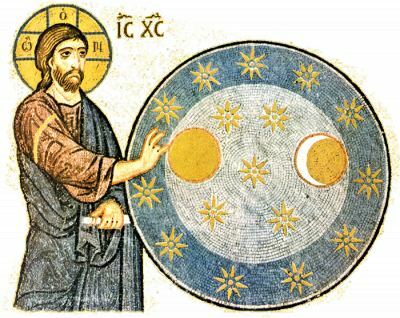 The next post will be about the Cosmology of the Old Testament. - "God could have not created the world, because the world adds nothing to God, and for that reason God is free. He does not act out of necessity." - "What is created originates from non-being, whereas what is uncreated is not a creation. It always existed and will always exist." - "From the experience of glorification or vision of God, the Prophets, Apostles and saints know that there is no similarity at all between what is uncreated and what is created. This means that created things are not copies of uncreated archetypes and types. Creation is unique as a construction in itself, just as what is uncreated is unique in itself. This means that, if universal concepts exist, they do not apply in any case to the uncreated dimension of existence." - "Uncreated things exist always and do not have a beginning or end. And all created things come from nothing according to God's will. Nothing created comes from God. Only the Son, the Spirit, the energies and so on come from God. Everything from God is uncreated. Created things are from nothing. This category of patristic thought is very important." - "For the Fathers, whatever comes out of nothing is created and everything uncreated is from the Father. So the Word is from the Father and uncreated, and the Spirit is from the Father and uncreated, whereas whatever is from nothing is created." - "Anyone who has reached glorification knows about the creation of the world, because he sees then what comes from the Father and what comes from non-being. He sees the Persons of the Word and the Holy Spirit, Who originate from the Father through generation and procession, and he sees those who originate from non-being, but who depend on the will of God. Whatever originates and has its existence from the Father and not from non-being is uncreated, whereas anything that originates from non-being is created." - "All created things made by God are material and divided into visible and invisible. Those that are invisible are called bodiless, because they are invisible." - "The Fathers make a distinction between ages and time. Time and age are not the same thing. Time means solar time. In other words, the year, the months, weeks, and days. Ages, according to the Fathers, are the entire interval occupied by the creation in the entire universe. Time is the dimension in which the creation exists. Dimension means the place where the creation is, whereas time is the succession of months, days and so on. In addition, the time of the angels is in the ages without end, as angels are not restricted by matter." - "The incarnation did not come about for our salvation. The incarnation was decided upon and for that reason the world was created, and the Fall and salvation intervened. Salvation is not the essence of the incarnation and the creation. Many Fathers says this. St. Nikodemos of the Holy Mountain writes excellently on this subject in his Handbook of Spiritual Counsel. He writes there in a chapter about the Theotokos, and he says it very well. It is all taken from the Fathers of the Church." - "The purpose of the creation is the incarnation, according to the Fathers. Man was made for glorification." - "All things participate in the creative energy of God, but not in His glorifying energy." - "Creative means that it brings into existence, sustaining means that it maintains: in other words, maintenance. Like the plumber who comes to your house and maintains the pipes." - "The energy of God is everywhere. It is everywhere present and pervades the universe." - "There is a difference between the Fathers and Augustine on the following point: because Augustine identified the glory of God with Plato's archetypes and Plato's forms, illumination for Augustine was not the unceasing remembrance of God in the heart, but the vision of the archetypes in the essence of God, when someone conceives the archetypes or forms with his brain. We need to be careful here because sometimes the archetypes are used by the Fathers, but for the Fathers the archetypes are formless: they are not the Platonic forms, whereas for Augustine they are the forms that are identical to the archetypes. Here we have the forms. We have the rationes - that is to say, the rationes that are the inner principles (logoi). The inner principles (logoi) are called rationes in Latin. Augustine occasionally refers to the rationes. This would be fine if he went no further. This is the teaching of the faith, because we ought to know the inner principles (logoi) of things. However, for us these inner principles are not archetypal forms. They are not forms for divine purposes, destinies and so on; they are what God wills. For Plato they are not divine purposes. For Plato they are the originals of which the world is a copy. That is to say, there is a form of man and we are a copy of the idea of man. Yes, but man is not a copy of the inner principles (logoi) of being, because the principles of being are free from form and have no shape. The principles of beings have no similarity at all with created things in patristic literature." - "When someone is in the state of illumination he acquires natural theoria of beings, which means that he sees the uncreated energy of God within creation. He who is illuminated has the energy of God within him and sees the energy of the Holy Spirit in all created beings. One stage is when you see it through faith. That is to say, you understand the energy of God within creation when you accept the teaching of the saints. The next is when you see the energy of God within creation, when you participate in the illuminating energy of God."